Category Archives for "Gimme More Productivity"
Desk cable management. What is it and who needs it? If all you need to get your work done is a laptop with no mouse or external monitor, it’s not that hard to avoid problems with tangled cables. But as soon as you start connecting new devices the number of cables around you quickly adds up. As if managing your business, to-do lists and calendar wasn’t challenging enough, you’ll need to find a way to control cables. Especially if you want to keep your productivity at a decent level. 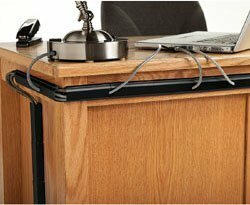 Why proper desk cord management can boost your efficiency? This is because having too many cables around is already distracting in itself. On top of that, cables that are hanging from your desk and laying on it quickly take a lot of space which could be used in a much more productive way. Not to mention that a clean and cable-free environment looks much more professional for your employees and/or clients. And, especially in business, you have just a few seconds to make the right first impression. Luckily, there are some very simple desk cable management ideas which you can implement at your workspace right away. Let's look at some under desk cable management tips. Tip #6. Got a Glass Desk? Stick the Raceway or Mount It on the Wall Instead! Sounds like a great plan, doesn’t it? Sadly, in reality, it’s not that easy. Most likely, you already have most of the devices that you are going to use, so investing in new ones just because they don’t require that many cables is not the best thing to do. Moreover, it might not be the healthiest choice either, as researchers are still arguing about the influence of radiation from Wi-Fi and Bluetooth on our health. But, even if all Wi-Fi devices were perfectly healthy and could communicate with each other without any delays or interferences, they would still need electricity to work (which means cables and cords). But, do not despair – there are better wire management ideas than that! What’s the main thing that makes a computer desk with cable management so hard? The length of the cables. If they’re too long, they’ll hang off the desk and tangle themselves. And, if they’re too short, you’ll need to reorganize your whole workspace just to connect all the devices! To deal with that, the easiest thing you could do is get just the right length of cables at Wire & Cable Your Way. They have just about any cable you can think of and sell them by-the-foot! But, it’s not always an ideal solution either. This is because before you buy them, you’d have to remeasure all your current cables (with little margin for error). What’s worse, once you’d get them, it’d be hard to move the devices around without having to buy new cables! Luckily, you don’t have to do all that to manage your office cables more effectively. Instead of getting rid of or shortening the cables, you can just reroute or hide them! The easiest thing to do if you don’t want to invest in wireless devices or cables of different length? Just make a hole in the desk and route the cable through it. This would make a great computer desk idea. For example, you could create a hole immediately behind each monitor. This helps reduce the visible length of cable to the bare minimum. Additionally, you could create a hole for a power cable of your laptop. That way, all you would need to do is put your laptop on the table and connect its new “super short” cable to it. Of course, a hole in the desk is not the most visually appealing thing. While it helps save a ton of space, you need to hide the holes after you create them. That’s where a desk grommet comes in. The most affordable desk with cable management solution on the list. For just a few bucks you can easily minimize all the space taken by your cables. 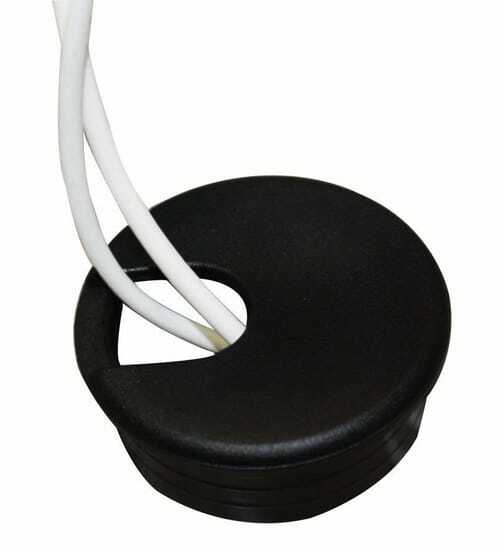 And, if you have a white desk, this black desk grommets will look quite elegant on it. Thanks to 3 different adjustable size openings, they can fit almost any size of cable or cord. The downside is you have to do some manual work beforehand (the holes). Moreover, they tend to twist, what can lead to the widening of the whole overtime. But, there’s an easy fix. To prevent this from happening, use a little bit of glue to stick them to the desk. If you’re okay with a bit of manual work – go to Amazon and grab your own set – there’s no cheaper way of getting it done! Tip: You can use a desk cover to shield the cables and grommets from view. Instead of creating holes (and potentially damaging the desk), you may want to hide them in a special tray or raceway under your desk. The good news is, doing it is a piece of cake. All you need is a special with cable management tray that you hang under your desk (usually at the back) and just put all your cables inside. Or you can find a desk with built in cable management, or a computer desk with cable management. There are many to choose from, and the final pick will depend on the style of your desk as well as on its width. 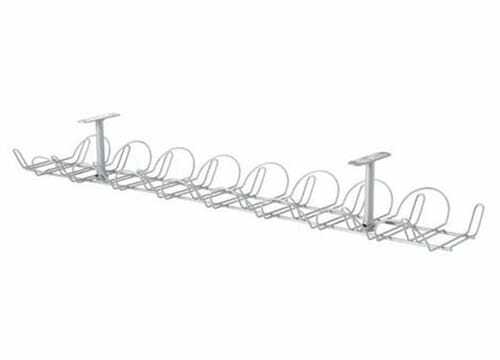 A simple yet sturdy cable rack. 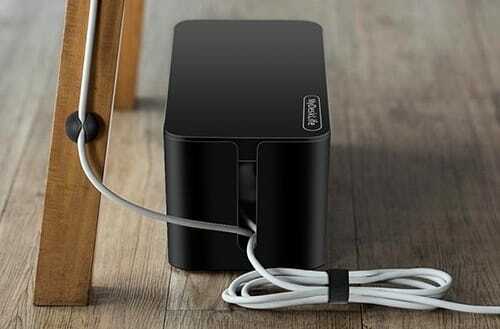 While it doesn’t fully conceal your cables, it allows you to pull the cables in and out of it whenever you need to (to connect them to a power outlet or other devices). Although the construction of the rack is quite simple, it is possible to fit in a small power strip. Probably the simplest cable tray on the list. 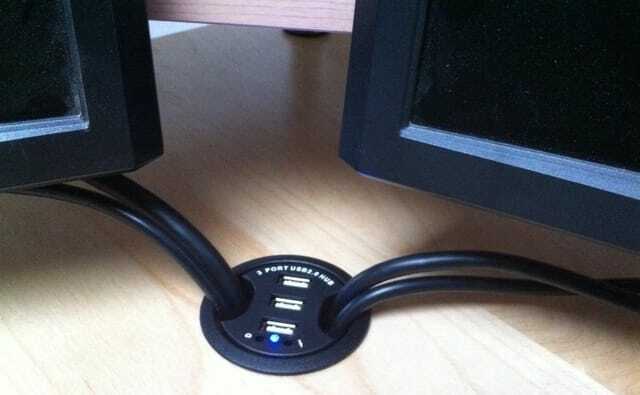 Just mount it under your desk and route all your cables through it. 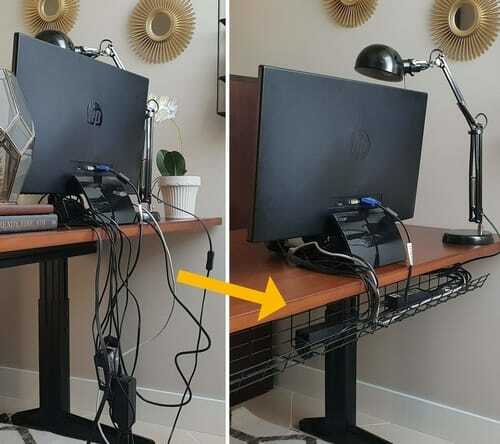 Obviously, just like the IKEA’s choice it won’t hide all your cables, but at the dimensions of 36"L x 6"W x 4"D, it’s one of the most convenient under desk cable and wire management solution that can easily fit power strips or small power bricks. Do you have a small desk or want to hang two shorter trays separately to manage cables in a more customized way? This pack of two 18”-long trays (6.2”W, 4.3”D) is exactly what you’re looking for. 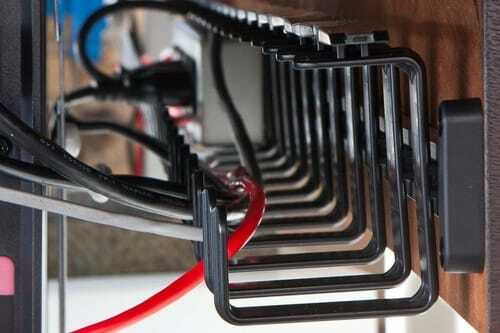 You can easily combine them together or mount separate trays for different types of cables. Another advantage of a cable management setup using two smaller trays is that they are more reliable than just one tray. This is because each of them is installed using separate screws, meaning they support one another if they both have the same cables routed through them. On top of that, their design makes it easy to access or add any cables at any point. 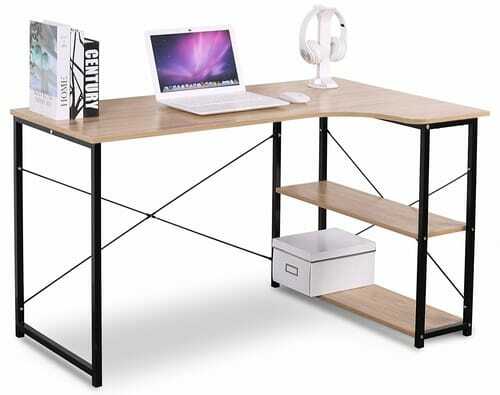 The above desk cable management trays are excellent choices for a computer desk. But they are not the best pick if you want to manage cables working at a standing desk. This is because, at the end of the day, you will still have lots of cables hanging behind, and putting all the power bricks and strips in a simple tray may not be possible due to their weight and size. 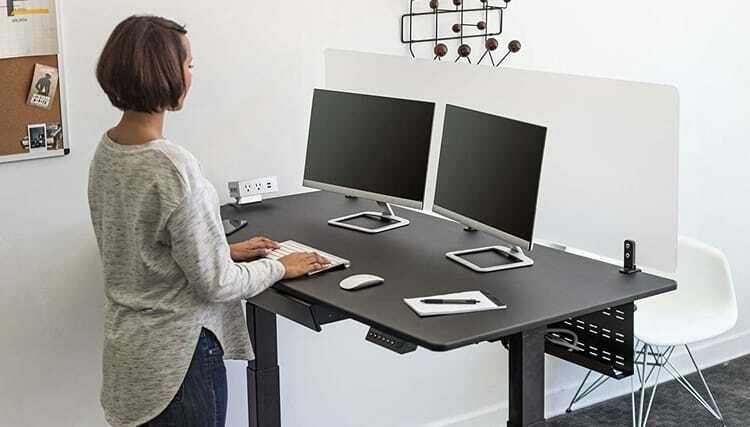 Naturally, the manufacturers have already noticed the problem and are offering much more robust and bigger solutions created specifically for those who love working at a standing desk. If you are looking to hide all your cables inside one tray, you will love this black Raceway. 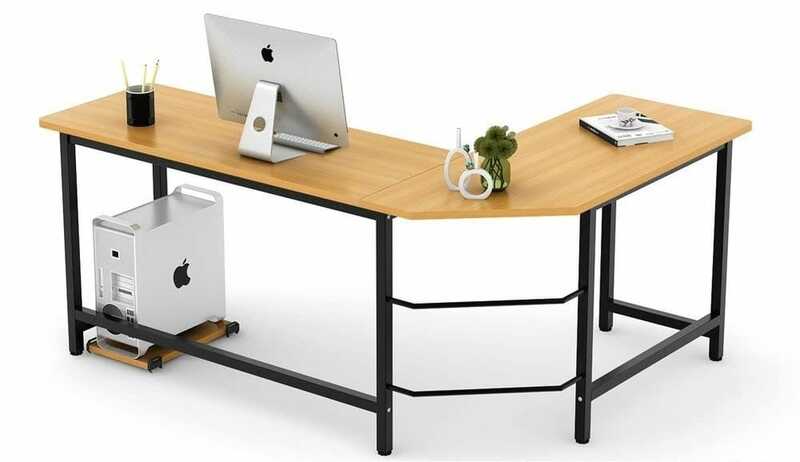 Designed specifically for standing desks, it’s robust enough to store all your cables, power bricks and a power strip. This, combined with its three openings (on either side and in the middle) makes it super easy to reduce the number of hanging cables to just one power strip cable. 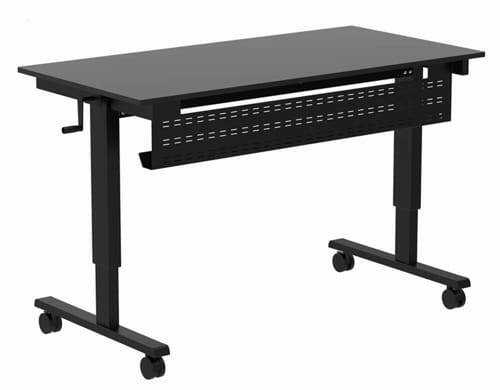 At 60” width it’s compatible with all flat top electric desks. An extra benefit is that it comes with a neat modesty panel, giving you an extra bit of privacy. 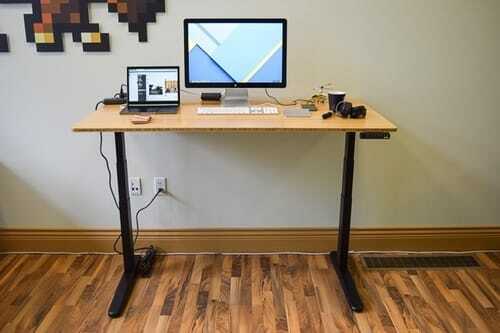 Got a standing desk? Check out if it fits yours! Looking for an elegant cable management solution that will give you more control over tangling cables than a standard tray? These Mesh Cable Raceway allows you to both hide the cables as well as easily access them any time you want. And thanks to the built-in power strip, you don’t have to worry about cable length on any of the devices. But, not only that – it’s robust enough to hold a power adapter for the monitors should you use more than one. 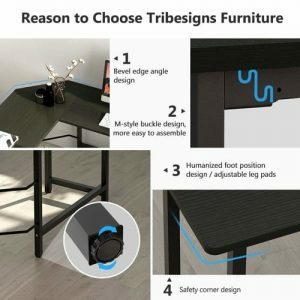 Top that with Velcro strips that make tying cables together and managing them a breeze, and you have a standing desk cable management winner – check it out on Amazon now! ​Got a Glass Desk? Stick the Raceway or Mount It on the Wall Instead! All the trays and raceways I’ve mentioned above are great if you can actually mount them to your desk using screws. This makes glass desk cable management pretty hard. And, as glass top tables are quite popular and look great in modern offices, there’s a big need for a solution. Luckily for you, some of the raceways can be mounted without any screws or even used to hide your cables on the floor against the wall or on the wall itself. 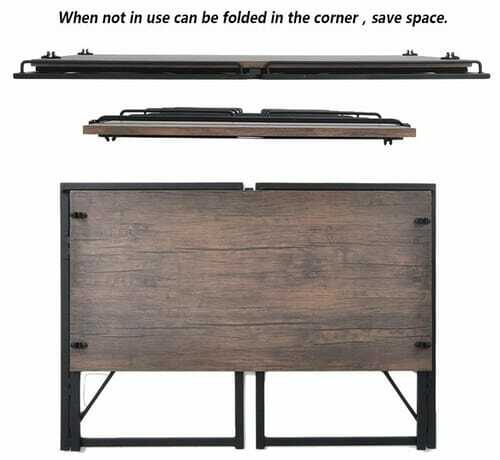 Although, just like the above examples, its created mostly for use under your desk (and, more specifically for the Jarvis Adjustable Height Desk Frame), it’s very easy to cut it to change its entry and exit angles(all you need is a pipe saw). Because of that, and thanks to the ability to mount these trays facing up or against the wall, they can be used to hold your AC power supplies even if you have a glass top table (or simply don’t want to do any alterations to your desk). 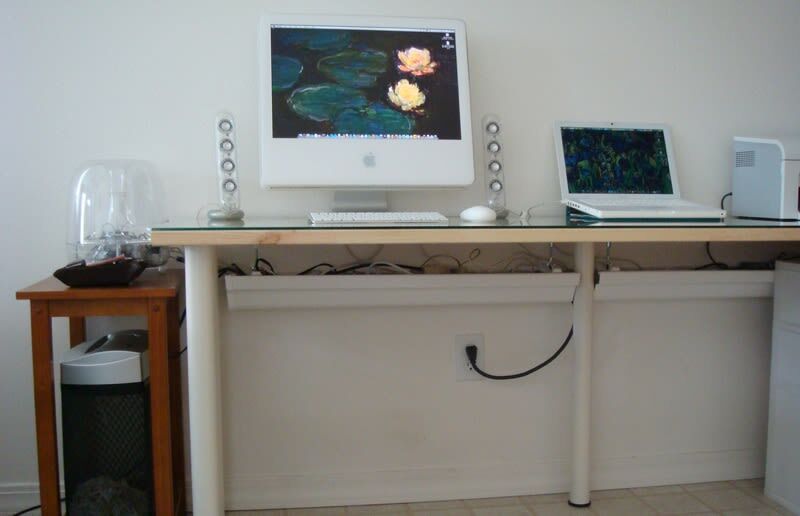 Moreover, they work great if you need to hold cables on “longer distances” – for example, between two different desks. In fact, head over to Amazon to see how others use it to manage their cable mess effectively. This raceway is perfect if you still want to install it under your desk but, for obvious reasons, can’t use any screws. This is because all you need to install it is to peel the 3DM tape off and stick the raceway under your desk. It’s as simple as that! No screws, no damage to the desk. But, there is one slight drawback. Because you stick it, it’s not the most robust option to manage your cables. For example, it won’t fit any power bricks. But if that’s not a problem for you – jump over to Amazon to get it. 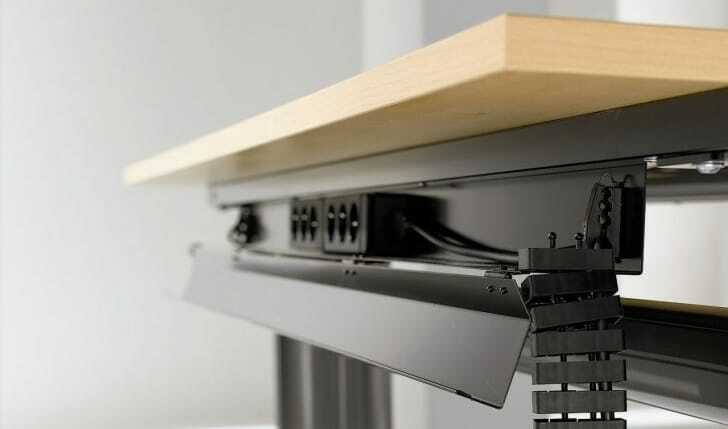 Trays, raceways or holes in the desk are great if you need to manage cables that are already under or get routed under the desk in one direction. But what if you want to have the ultimate control over all cables at your desk – regardless of their size, direction or length? In this case, a simple cable management tray is not enough. Instead, you need a comprehensive solution that will allow you to organize cables and power cords of all shapes and sizes. From monitor and keyboard cables that go behind the desk to those small ones, such as USB cables, phone chargers, and mouse cables. 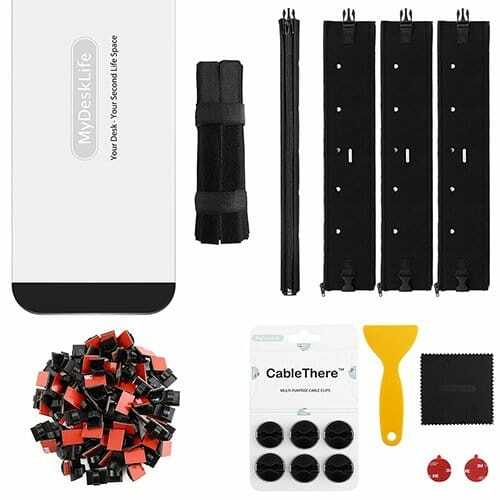 An elegant kit that’ll help you keep all your cables under control and even get rid of the clutter from excess cables once and for all. 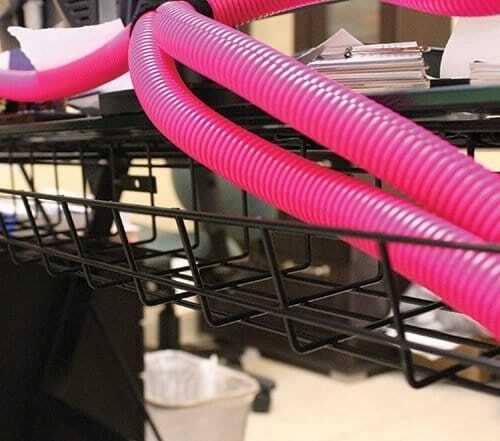 Simply use all of its cable sleeves and clips to hide and route all the cables to a neat black box that’s big enough to store a power strip but small enough to not be considered an unwanted obstacle in your office. Having a clean, cable-free office environment is the key to boosting your productivity. On top of providing you with a lot of extra space, it gives you peace of mind and makes it easier to focus on your day-to-day tasks. Not sure which cable management solution to choose? Scroll up to the one that looks like it would best suit your needs and head over to Amazon to read its customer reviews – those can often give you a lot of extra insight. How many times have you sat down at your desk only to find yourself completely unmotivated and unwilling to work or study? Unfortunately, it’s not uncommon to associate sitting at a desk with hard labor. Luckily, there is a nifty trick that can help you change the way you think about your work and make you fall in love with your office space again. I’m talking of course about changing your old desk into a comfortable and modern desk. Why does this small change can have such a huge influence on you? 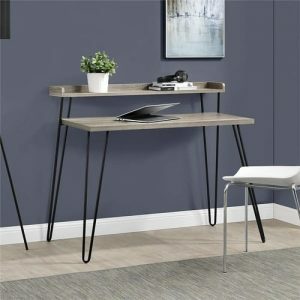 Where to Look for a Modern Office Desk to Grab the Best Deals? Because of how important a desk is in your life, the process of choosing one should be all about you. In the end, some of us spend long hours at our desks every day. Do you feel good around vibrant, bright colors? Pick one that’s colorful or that’ll look good in an office full of many different colors. Or maybe you’re a fan of the “less is more” approach? Thanks to the huge variety of modern desks, everyone can find one that’s affordable, sturdy, and meets their requirements. Simply speaking, you should ensure that it matches your taste and your style. Robust and yet light. Forget about huge wooden things that weight a few hundred pounds and take half the room. Even modern wooden desks are a lot lighter and less bulky than their old counterparts. And yet they are often just as sturdy. Easy to move around. The average modern desk is very light. Thanks to that, you can put it together on your own or rearrange your office any time you feel like it. Designed to be comfortable in today’s working environment. Many modern desks are designed with one goal in mind – your comfort. Manufacturers know that we spend more time seated than ever before. And they want to help us work as efficiently during those critical hours as possible. Fashion can be pricey. Luckily, you don’t have to buy an overpriced piece of wood to make your office look cool and skyrocket your work comfort. The Internet provides you with a tremendous opportunity to look for your dream products at the best price. This includes furniture. 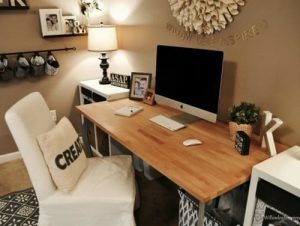 But, because buying a desk is different from getting your groceries around the corner, it’s best if you grab your desk from a trusted store such as Amazon. This is because they secure your transaction with their very generous buyers protection program and you can read hundreds of product reviews before you even hit the buy button. Now that you know where to look for a cool modern desk, it’s time to list all the critical things worth considering before you spend your hard-earned dollars. Because there are lots of designs that fall into the “modern” category, first and foremost you need to see whether the desk matches your style (something I’ve discussed earlier). Its sturdiness. You don’t want to pay extra for the desk just because it’s cool. Especially if it keeps wobbling, or, even worse, falls apart after a week. That it’s comfortable and has enough legroom. It may sound like a no-brainer but some people choose looks before convenience. Don’t do that – you will spend hours working at your desk. That it’ll serve its purpose. Similar to the above, ensure that the desk will not just fit your office, but that you actually want to work at it. Its size. Ask yourself how much space you need for all your stuff. Do you have a lot of work accessories and other stuff to put on it? That it has a timeless design. Not a must but some desks could fall out of fashion pretty soon. To help you find a desk meets all of the above requirements, I picked five bestselling modern desks that are made of quality materials, look cool and I believe could be a great addition to your office. If you’re one of those who believe that modern design is all about simplicity, you’ll love the Zinus modern rectangular desk. 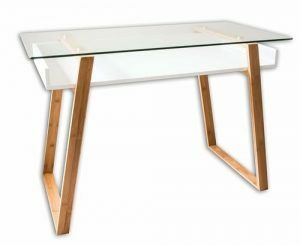 It blends the best qualities of simple design with sturdiness what resulted in a timeless piece of furniture that can be used as an office desk, computer table or even a dining table. I think that modern design doesn’t get any simpler than that – naturally, assuming that you want a reliable quality desk. And because it’s available in three different colors (white, brown, and black – click here to compare them), it will easily fit into many different offices and homes. Of course, not everyone has to like its design. In the end, it’s just a frame and a wooden top – but there are a few reasons why I chose this desk to “represent” the simplicity category. What I Like about This Desk? You can put it together in as little as 10 to 15 minutes top. It’s very comfortable – lots of legroom, no weird addons that could impact its convenience. Its timeless design. Desks such as this one will never get old and are one of the best-looking modern desks for office I’ve seen. If that wasn’t enough, it comes in two different sizes - 47”x24”x29”h and 52”x24”x29” for those who need extra space. And What I Don’t Like? Sometimes it’s hard to get through to the post-purchase customer service representatives. While you shouldn’t have any problems with this desk, those who happen to come across any problems might have to spend some time on the line. Hopefully, this has changed by now though. Because its just 4 legs and a desk, it can wobble a bit. But that happens only if you intentionally put extra pressure on it. 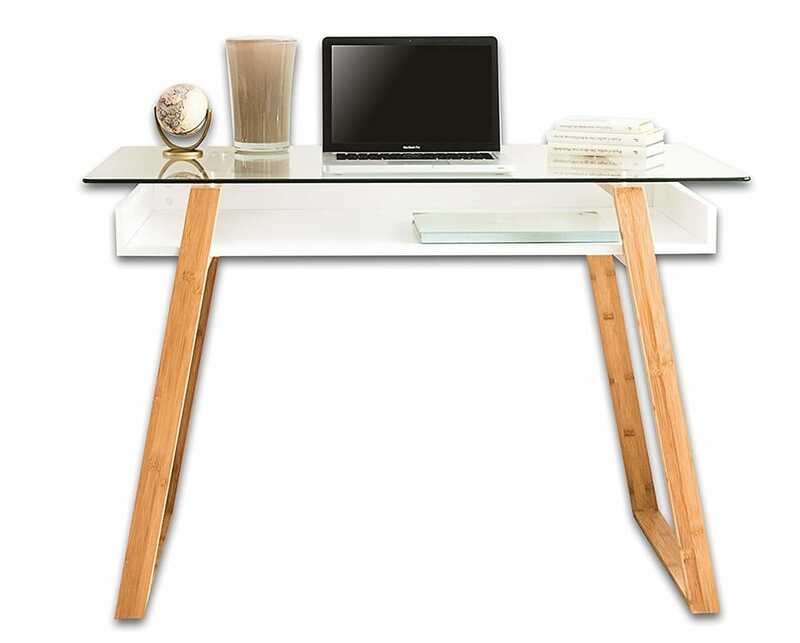 Looking for a simple and yet modern desk that will never get old? Don’t hesitate and click the button below to get to Amazon and grab the desk that’s designed to fit any office space! While not everyone loves industrial design furniture I believe this modern industrial desk is actually one of the most interesting modern desks for home. Even despite its quite small dimensions – just 39.4”W/19.7”D/29.5”H. Sit down at your desk, do your work, and fold it once you’re done. Not only is the desk created to take as little space as possible, but you can actually fold it once you finish your work, freeing additional space at your office or living room. 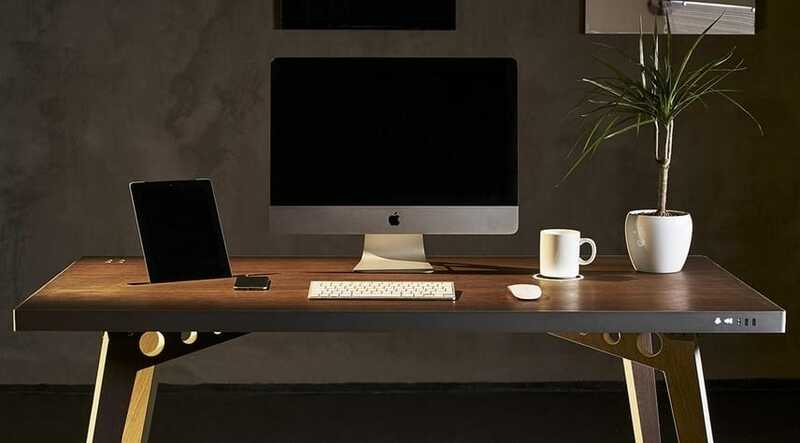 Thanks to that little function it can serve as an excellent computer or office desk for someone who considers themselves a modern minimalist. 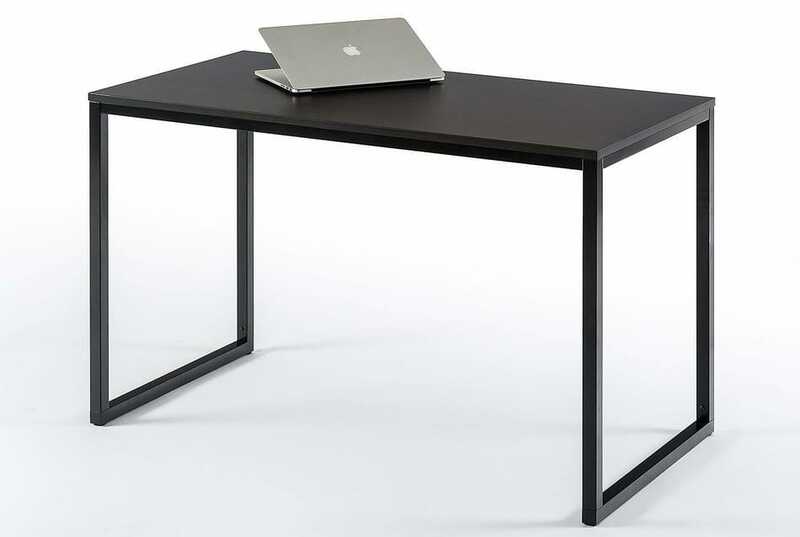 This desk is also one of our top minimalist desk recommendations. Its design – it’ll make your office look stylish and modern. Foldability - it really helps manage your office or home space in a modern and effective way. And the best is, this feature doesn’t affect its convenience at. You can get a version with a handy basket. If you go to its product page and browse through the related products, you will find a very similar desk that comes with a handy basket that can fit all your belongings while you keep your workspace clean. Some of its parts are hard to put together – that’s why I suggest that you take a quick glance at what others shared regarding the assembly in their product reviews on Amazon. The metal parts – while I like them for their looks (without them, the desk would not be that interesting), they can be a huge pain – especially if you like to have a lot of legroom. While the frame is super sturdy, the top lacks quality and is prone to scratches. Unless you are a huge industrial design enthusiast, I would say that there are other modern desks that could better fit your office space. Can an almost completely wooden desk look and feel modern? Designers that came up with this Monarch’s desk prove that it’s not only doable but that the results can be really great – especially if you’re looking for one of the best modern desks that's created to be functional. It's a desk with shelves that can function as a small computer desk with hutch. Wood is rarely associated with things that are trendy and modern. Unless it’s used to create a modern convenient L-shaped desk. It's a modern desk with drawers! Unfortunately, its design limits the stability bit, and you have to be very careful when assembling it. But because it's a small desk with hutch (the side shelves), it's perfect to stow your small stationary items to keep your desk clean and make you more productive. Word of caution – to mount the L section to the rest of the desk, you need to make extra sure that the pre-made holes are lined up. Of course, you might re-drill them to give the desk a different shape – but the L works just fine on its own. Even though it’s made of wood, it’s very sturdy. Looks even better with a productive indoor tree to the side of the hutch. Very convenient - lots of space on the top as well as on the sides thanks to smart compartmentalization and drawers (even though you can put a lot of stuff into it, it doesn’t take that much space on the floor). Desk with return - The return can be positioned on the left or right of the main desk. However, make sure you measure out the required space before purchasing. 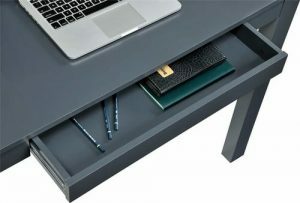 Small desk with file drawers - Lots of files to store? Not to worry, there's tons of space for your files in the drawers under the main desk. It's a great white corner desk with drawers. It’s really hard to put together. Coaster desks are typically not easy to assemble. Sadly, this white computer desk with hutch is even harder – for example, there are no labels for the screws. It’s not that safe to put heavy stuff on the middle shelf – even if you ensure that it’s assembled correctly. You shouldn’t stand on it either. 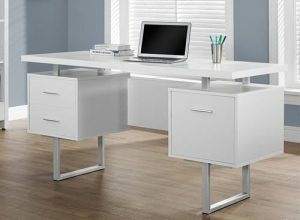 However, this white desk with file drawer is sturdy enough for your day to day use. It's weight. You might need help not just to assemble it but even to unpack it. Despite the hard assembly process, this desk is really beautiful – especially if you like wooden furniture. Although it’s not the most affordable one, for the amount of space that you get (60”W x 47”D x 30”H), it’s worth every penny. A great modern desk with drawers. And it doubles as a corner desk with file cabinet. Over the last few decades, glass was one of the materials most commonly associated with modernity. By looking at this bonVIVO contemporary writing desk I can assure you that things haven’t changed a bit. Wood, Bamboo, and Glass – a Perfect Match? While its usually steel that’s paired with glass to create modern and beautiful constructions, this time designers chose bamboo. Whoever came up with it, I must admit it was a brilliant idea. The shatter-resistant tempered glass top together with a lacquered wood shelf and bamboo legs creates. In my opinion, one of the best modern desks for home (or office) in terms of looks on the list. The white drawer gives you just enough space to store some notebooks, stationary or some other stuff that might come in handy. Thanks to clear labeling and packaging of all small parts, the desk is quite easy to put together. It’s quite big (43.3”W/21.6”D/29.5”H) even though it doesn’t look like that at all. Assembling this modern computer desk is really easy and can be done in less than an hour. But, because of its weight, it’s best if you ask someone to help you, especially in the last stage when you are about to get it upright. It can be very unstable when not assembled exactly the way it should be. Because of that, you need to be extra careful when putting it together. The bamboo is not a real bamboo – it’s just a finish. The non-glass surfaces are not of the top quality and are prone to scratches. While I’m not sure if the design will stand the test of time, if you want a desktop table that’s highly fashionable and pretty cool right now – this is your pick. 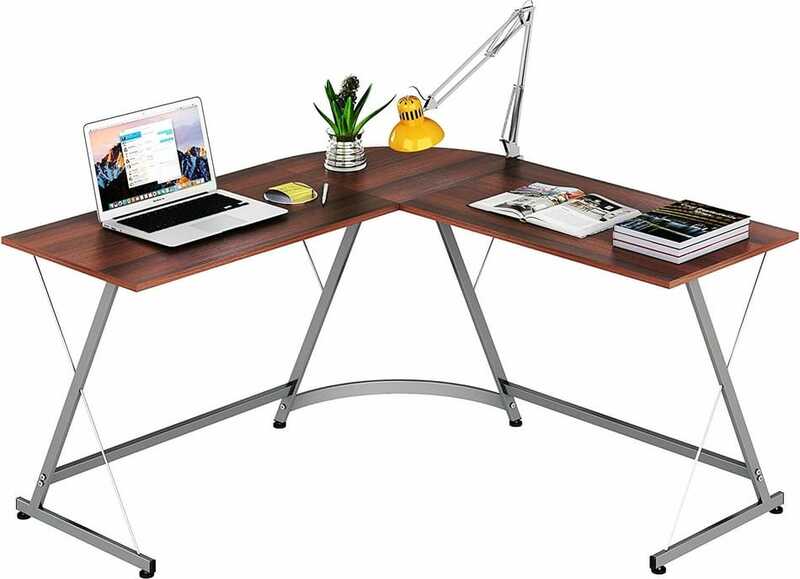 The last on my list of cool modern desks is another L-shaped one. But this time, you get a sturdy steel frame with a top made of solid piece of wood with a bright finish. The top is available in four versions – a standard black, white, teak and walnut. But what I consider the main benefit of this desk is how spacious it feels – it really is designed to support multiple monitors or desktop computers. And thanks to its quite minimalistic design, it looks as if it took a lot more space than it actually does (66.14”W/x 49.21"D/29"H). On top of that, the L-shape design allows you to keep many different things around and manage them effectively. Just put what’s really important on one half of the desk and any extra stuff on the other one. Lots of space. You could put on it a monitor, a laptop, keyboard, speakers, a printer and some documents - and still have enough room for more. It’s not your traditional desktop table! It’s very easy to set up – at least for someone who’s tall. Just put together the frame, mount the table top and you’re done. A free CUP stand - ideal if you are working with a desktop computer. I have mixed feelings regarding the long steel parts of the frame that connect the legs. While they are a great way of increasing the stability and sturdiness, they could limit your legroom. Especially if you like to stretch your legs from time to time without standing up. It’s very easy to overtighten the screws what makes aligning the tabletops very hard. Although the setup is quite easy, it’s a very delicate construction. You need to be extra careful especially when aligning the two parts. In the end, what I liked the most about this desk is the space that it gives you – it’s one of the most spacious modern desks for office. On top of that it’s super comfortable and will definitely suit all people who like to get their work done. If you’re one of them – click the button below and check out the desk yourself. Having a hard time deciding which of these cool modern desks to choose? Scroll up to the table and see a handy comparison of all five bestsellers. 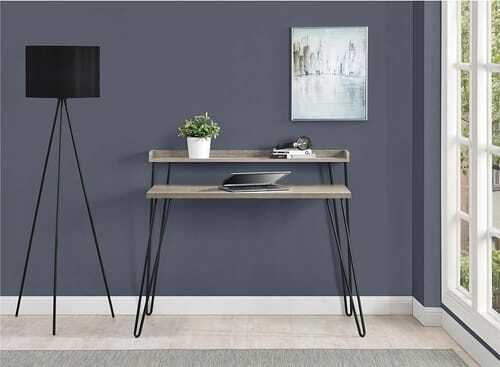 If you're in the market for a smaller sleeker desk, take a look at these minimalist desks. 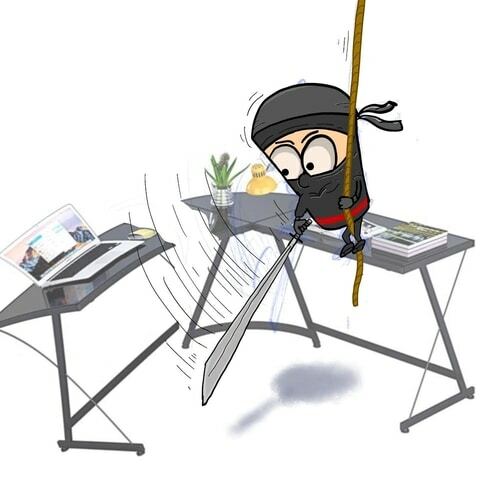 Before we talk minimalist desks, do you spend hours doing tasks others get done in 30 minutes? Do you secretly envy them their productivity and results? It could be that despite all the effort, you just can’t focus on what really matters. If that’s the case, it could be that your working environment is to blame. If you are working on your computer and keep getting distracted by all the things laying around it, you probably have too much junk on your desk, don’t you? But how to keep it clean? There are many ways you could go about it. My experience tells me that one of the easiest ways is getting a minimalist desk setup that’s hard to clutter in the first place! Why Minimalism Is a Remedy to Productivity Issues? How to Keep Your Minimalist Desk Clean – Even under Stress? Despite what many people think, minimalism is not about throwing away all your belongings. Instead, it’s better to stop and think about all the things that undermine your productivity. These could include both your physical possessions as well as your schedule or to-do lists. Simply speaking, sometimes we forget that we should put quality over quantity in whatever we do or have. And minimalism is exactly that. So why start with a minimalist or minimal desk setup? It’s simple. It’s a big piece of furniture that takes lots of space. And you spend a lot of time at it every day, so it has a profound influence on your mood and productivity. Because of the importance of your desk, when organizing your room, you should “adjust it” to your desk – and not the other way around. That's what we refer to as minimalist desk design. This means that on top of having a desk, you can have only the absolute essentials in the room in which you work. If you don’t, your minimalist desk décor will not be as effective as it could be in boosting your productivity. In the end, your desk is your common center. It has to be comfortable, clean and should be getting all your attention. To achieve that, reduce other office items. Look for other minimalist office furniture and minimalist office supplies. Store as many things digitally as you can. That way when you sit down to work, it will be a lot easier for you to get into productivity mode. A clean physical “command center” also helps you keep one other super important place clear – your mind. Even when things get tough. Getting a minimalist desk setup is just the first step. The more challenging task is keeping your workspace clean when you’re busy or under a lot of stress. This is because when we are nervous or tired, we tend to slack on things like staying organized. And this applies whether you have a minimal office space or a massive office space. The solution to that can be a little bit of discipline, small habits, and a minimalist desk organizer. One of the easiest habits to implement is creating a daily cleanup schedule. Leave yourself 10 or 15 minutes every day to clean your desk and everything around it. You can do that before or after your work. And if you have an organizer (some of the desks reviewers have them), it’s easy to keep all your stuff in order. The key here is consistency. If you build a discipline around a small habit like that, it will be easier for you to keep everything clean. Even when you will be unwilling to do that because of all the work piling up. Sturdiness. They look small but they should serve you for a good time. Does it wobble? Sometimes a fancy desk legs design makes the desk wobble after just a few weeks of use. Legroom. It has to both look good and be comfortable. That it will fit all your most necessary work items. And I really mean it. The goal is to minimize the distractions, remember? For this minimalist desk review, I picked five that are quite popular but differ in certain features. This will allow you to get a minimalist desk decor that will not only boost your productivity but will also make your office look really good. The first on the list is a walnut-color desk. 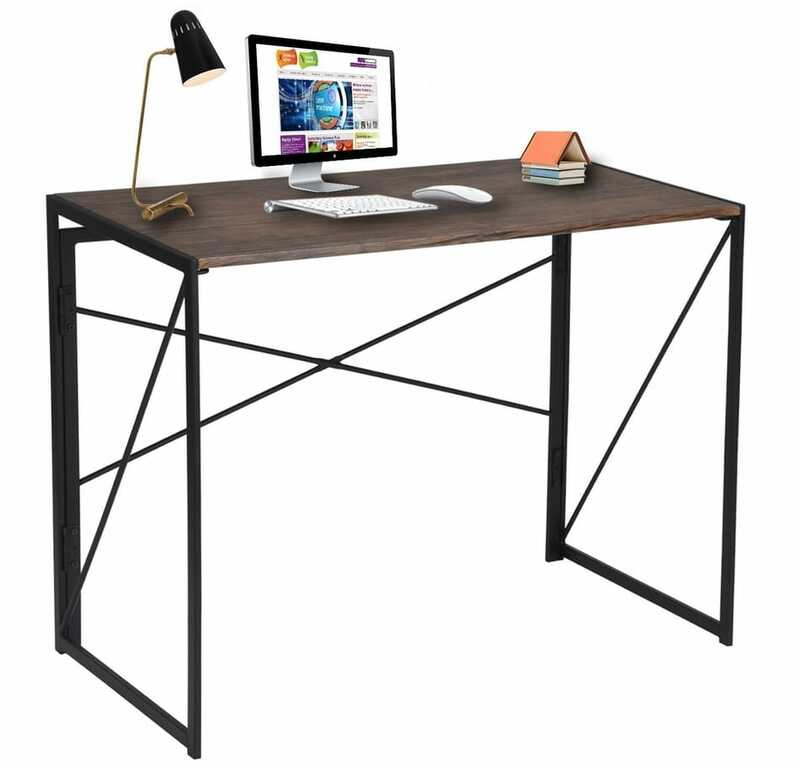 Its steel frame and dark wood make the desk look very sturdy and modern. And it really both looks and feels high-quality. 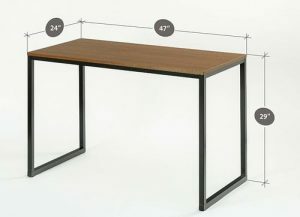 Thanks to the metal frames that connect the legs, the desk is very stable even despite its shape. I picked this desk because I’m a big fan of an L-shaped minimalist desk setup. This is because I believe it gives you a lot more space compared to traditional desks while being relatively small. Of course, the reason why you’re getting a minimalist desk is to minimize the clutter. That’s why not everybody likes the L-desks. But for me, being able to put some stuff next to me so that I don’t see it, and yet I still keep it on my desk is a great productivity booster. Simply because I sometimes need one or two things that I don’t necessarily want to look at all the time I’m working. This is the best L shaped desk in store. It looks and feels very sturdy. There aren’t many desks I would feel comfortable putting an expensive monitor on. High-quality materials. It doesn’t feel cheap either. Great stability. It doesn’t wobble as much you would expect it. Despite its shape, it’s very easy to move it around. Great looking desk in middle of room. Won't stand out awkwardly. Footrest bar is no longer comfortable if you’re tall. In fact, the whole desk is not a perfect choice for taller people. Luckily there’s a minimalist desk every tall person will love. You will most likely need a friend to help you assemble it. Or at least help you move it around once you put everything together (as you assemble it having it lay upside-down on the ground). The most expensive on my list. Overall, with the dimensions of 51" W x 19" D x 28.5" H (51" overall depth), I believe it’s a great choice for every office. Especially if you are looking for a desk which you can put in the corner, save valuable space and declutter the room. 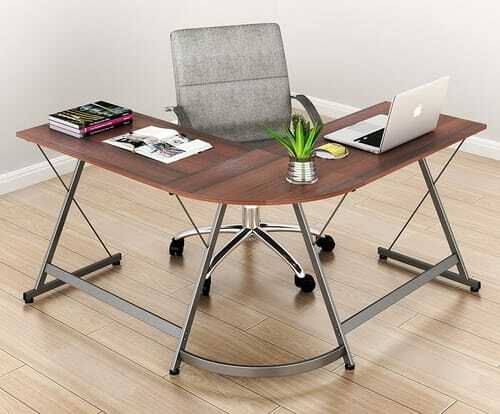 If that’s the case, click the button below and check out what others think about this excellent L-shaped minimalist desk. 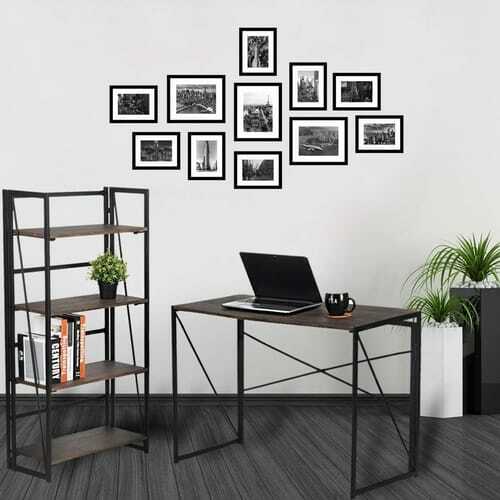 The second on my list is a neat retro black minimalist wood desk that will undoubtedly help you update your office décor. 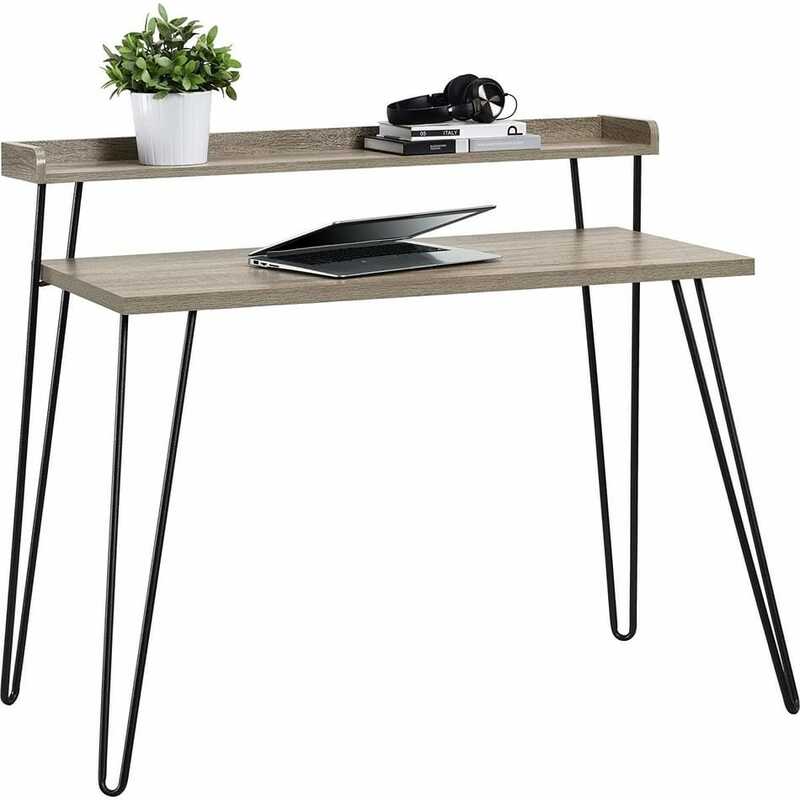 Its espresso top surface together with gunmetal gray hairpin legs are an excellent fit for every home office design to minimize distractions. 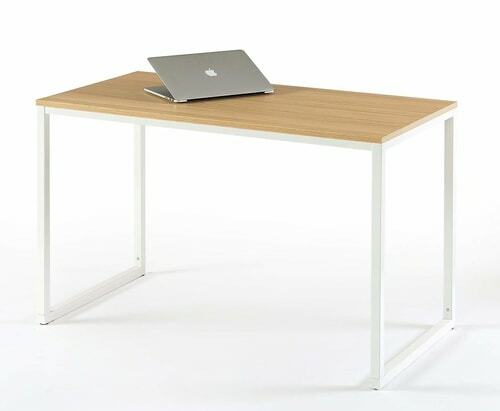 But, if you’re looking for a white minimalist desk, it comes in four different colors, making it an excellent choice for almost any office space (sugar pine/white, walnut, Sonoma oak and espresso). If you’re of an above-average height and hate it when you have to hunch at a small desk, you will thoroughly enjoy your new workspace. Just put the screen on the riser and forget about having to lean to accurately see what’s on the screen. You could even use it as your very own minimalist standing desk! Naturally, there are many other ways in which you could use the riser. 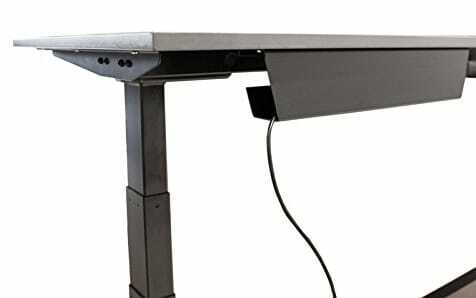 Even though it may not look like the sturdiest desk you have ever seen, it can hold 20 lbs. (riser). And the desk itself holds 70 lbs., meaning you can easily pack (and organize) all the essentials on it. 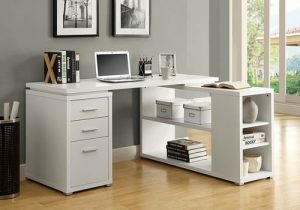 Better yet, it's a great home office desk to use in the middle of room. Especially a desk and chair combo. The best minimalist desk setup for tall people and small offices where floor area is priceless. It can be easily put together using a battery-operated hand drill. It’s easy to damage it if you overtighten the screws. Because of the leg design, it’s hard to move it. Luckily, it’s quite light so you can always lift it up a bit (or ask someone to help you). 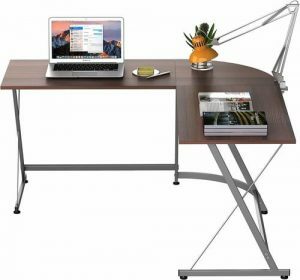 Overall, with the dimensions of 35.4”H X 44.7”W X 23.8”D, the desk will allow you to put everything you need on it, without going overboard and cluttering your workspace. You could even put two screens on it. 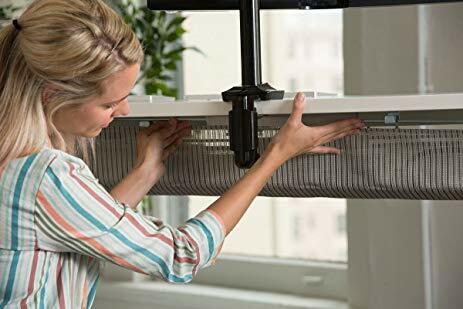 The only thing you need to keep in mind is that because the top part is quite narrow, you will need to keep the desk a bit further from the wall. Simple and sturdy – these three words say it all. 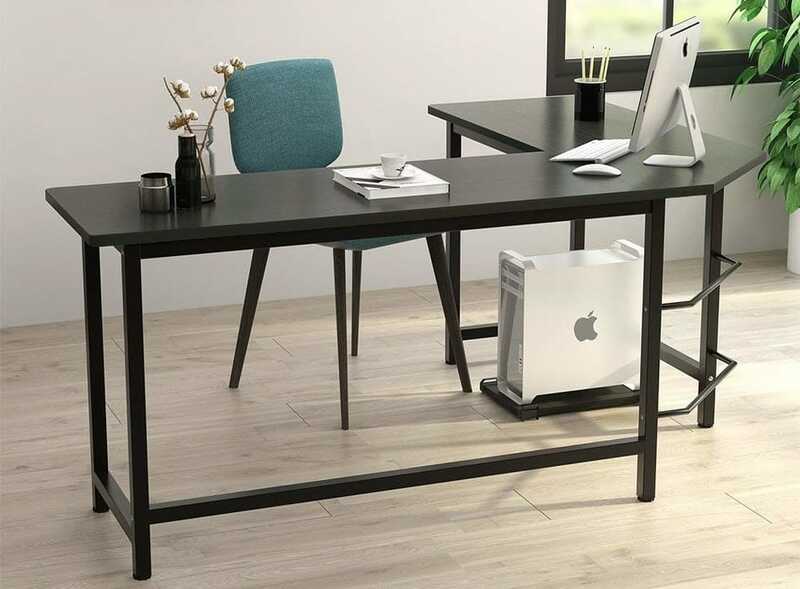 On top of that, the desk is available in three different colors (white, brown, and black – a perfect choice for someone who is looking for a classic, fully black minimalist desk) making it as far from overwhelming as it gets. If I were to pick one desk for someone who has a really big problem with focusing on work and is looking to keep things as simple as possible, I would send him straight to this one. On my personal scale,this desk ranks the highest in terms of minimalism. All that thanks to cutting its design down to an absolute minimum. A metal frame and a solid top – does anyone really need anything else? it’s super easy to put together. It can be up for use in under 15 minutes. Its design is truly minimalist. It could double as a minimalist table. Available as a white and brown desk. Aesthetically pleasing to the eye. It wobbles a bit. Naturally, it doesn’t wobble if you use it like you would use any other desk. But if you put some extra pressure on it just for a test, you will see it slightly move. It’s quite hard to reach the seller’s post-purchase customer service. It’s not impossible, but it takes some time to get through. It might have changed by the time you read this, though. 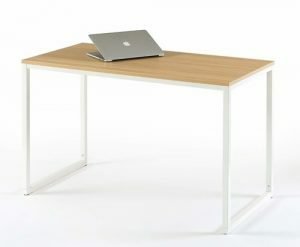 This simple computer desk is exactly what it says – simple, and designed to fit the absolute essentials (its dimensions are just 39.4”W, 19.7”D, 29.5”H). 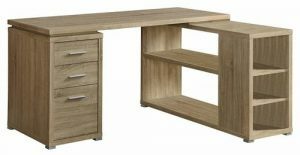 And while it’s also quite similar to the previous desk I have reviewed, the biggest difference between the two is its industrial style. While the design easily fits all the “minimalism norms”, not everyone will love the extra metal parts around the legs and frame. While they make the desk look great, they can reduce its comfort significantly. As it usually is with this kind of desks, it’s all about the legroom. If you hate hitting accidentally on various stuff (especially cold and metal), you might hate this desk. And if you’re tall, you will hate it. Sorry to say that (but, in this case, just check out the second desk reviewed). Available in two variants. The classic one and a slightly bigger one with a cool basket which can be used as an excellent minimalist desk organizer for all your essentials. But it can also take away some space – click here to see if it works out for you. Foldable!! 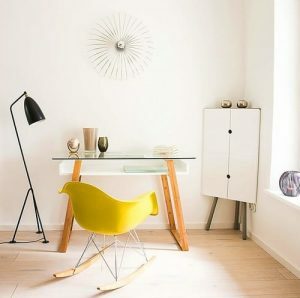 A real minimalism geek dream – finish your work and just fold the desk in the corner to save space and focus on relaxing. …only if you know what to do. If you don’t, you can spend a lot of time trying to put it together (you can find all the tips shared by Amazon reviewers). Lack of legroom. The metal parts may look cool, but they are also very annoying. Overall, it’s a good table but nothing spectacular. I believe that there are better choices for that price. But, because its design is quite unique, you might just fall in love with it – despite all that I’m saying here. The last pick is a simple wooden desk with a convenient drawer to hide all your belongings. And thanks to its wide variety of colors (white, teal, black, espresso, grey, navy and white), it could be a great fit for many different office areas. The only desk on the list with a drawer which makes it very easy to manage and organize your stuff. Naturally, you need to make sure that you don’t just keep hoarding stuff inside it – otherwise, it won’t add much to your productivity. 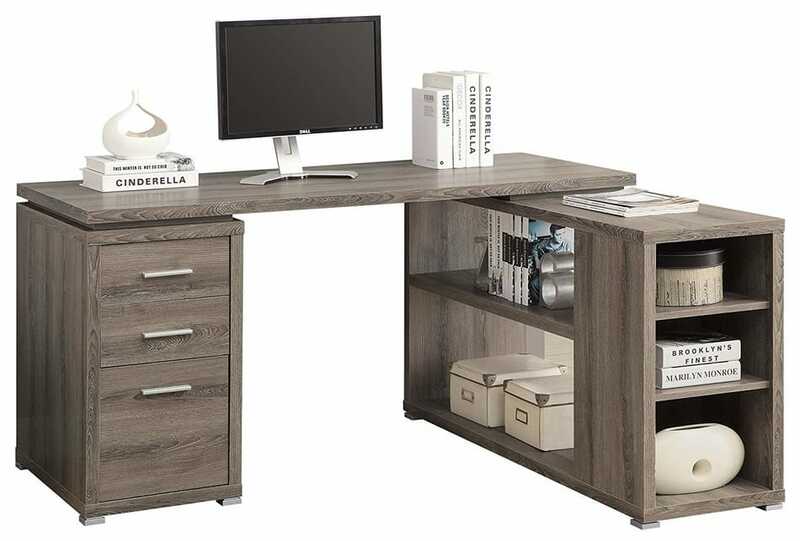 And with its very simple and natural design coupled with small dimensions (just 39”W x 19.7”D x 30”H), this desk can really help you create a productive space in your office. The drawer. You can hide all your stuff in seconds! 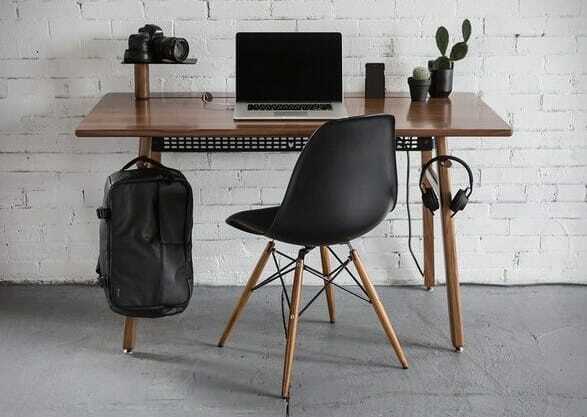 Raw simplicity - no other desk can beat it. 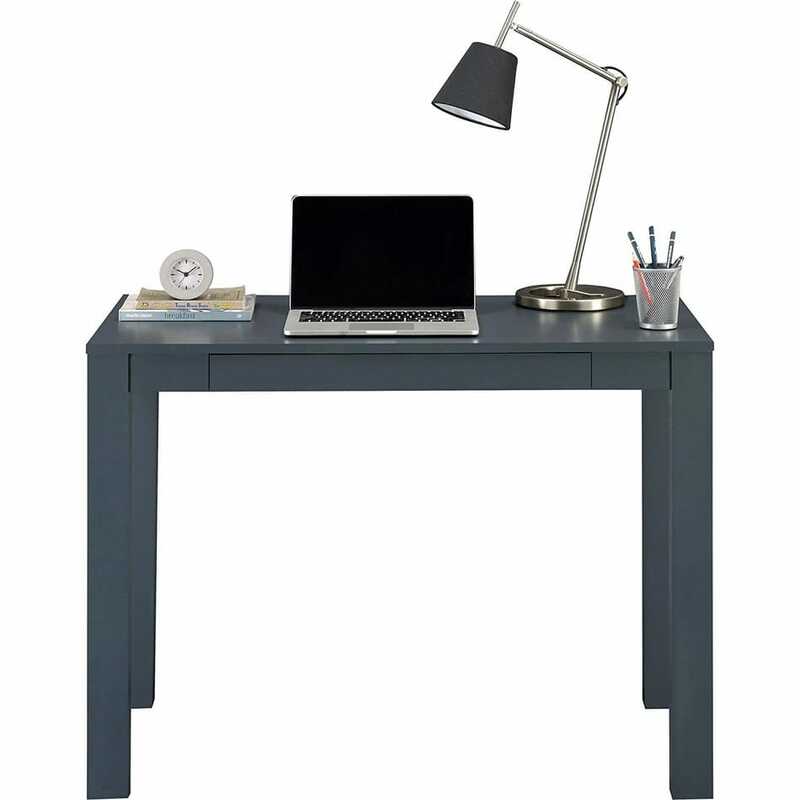 Pair this desk with your black and white home office and it's sure to stand out. Despite its looks, it’s hard to put together (because of cheap materials used – it’s most likely made of shredded recycled wood). Because of the above, it’s highly vulnerable to damage, especially during assembly. If you put the screws the wrong way on your first try, you might compromise the stability of the desk. The drawer doesn’t open all the way out and might drop a bit if the desk is not put together correctly. Despite its great design – especially if you’re looking for a white minimalist desk – I didn’t really like it. Even the drawer didn’t help it. At least for me. But, you might enjoy the convenience of being able to throw all your stuff inside the drawer without stopping your work. When looking for a minimalist desk décor, it’s very easy to focus on what’s trendy, instead of what you really need. That’s a big mistake. The goal is just a simple as your desk should be – determine 1 or 2 primary features and accessories that you want and just pick the desk. They’re all very simple, so there is nothing to stress about. Now scroll up, pick the desk, and start working the way you should! After you find your perfect desk, it's time to improve your productivity with some greenery. How? With the best indoor trees of course! Best 20 Morning Rituals To Empower Your Body, Mind and Soul Magically!